Bank of America CEO Ken Lewis has testified that former Treasury Secretary Hank Paulson and current Fed Chairman Ben Bernanke essentially forced him to acquire Merrill Lynch despite evidence of its growing losses. Even though this was certainly done with “America’s best interests” in mind, it’s still a bit troubling. It’s especially troubling because in 2009, 6months after the acquisition, John Thain, Merill’s CEO at the time of the crisis and the take-over was forced out for hiding Merrill’s true losses from Bof A and its own shareholders. Merrill Lynch rose to prominence on the strength of its brokerage network (15,000+ as of 2006), sometimes referred to as the “thundering herd”, that allowed it to place securities it underwrote directly. In contrast, many established Wall Street firms, such as Morgan Stanley, relied on groups of independent brokers for placement of the securities they underwrote. Until as late as 1970, it was known as the “Catholic” firm of Wall Street. The firm went public in 1971 and became a multinational corporation with over US $1.8 trillion in client assets, operating in more than 40 countries around the world. In 1977, the company introduced its Cash Management Account (CMA), which enabled customers to sweep all their cash into a money market mutual fund, and included check-writing capabilities and a credit card. Fortune magazine called it “the most important financial innovation in years”. In 1978, it significantly buttressed its securities underwriting business by acquiring White Weld & Co., a small but prestigious old-line investment bank. Merrill Lynch was well known for its Global Private Client services and its strong sales force. In November 2007, Merrill Lynch announced it would write-down $8.4 billion in losses associated with the national housing crisis, and would remove E. Stanley O’Neal as its chief executive. O’Neal had earlier approached Wachovia bank for a merger, without prior Board approval, but the talks ended after O’Neal’s dismissal. Merrill Lynch named John Thain as its new CEO that month. In his first days at work in December 2007, Thain made changes in Merrill Lynch’s top management, announcing that he would bring in former New York Stock Exchange (NYSE) colleagues such as Nelson Chai as CFO and Margaret D. Tutwiler as head of communications. Late that month, the firm announced it would sell its commercial finance business to General Electric, and would sell off major shares of its stock to Temasek Holdings, a Singapore government investment group, in an effort to raise capital. The deal raised over $6 billion. In July 2008, Thain announced $4.9 billion fourth quarter losses for the company from defaults and bad investments in the ongoing mortgage crisis. In one year between July 2007 and July 2008, Merrill Lynch lost $19.2 billion, or $52 million daily. The company’s stock price had also declined significantly during that time. Two weeks later, the company announced the sale of select hedge funds and securities in an effort to reduce their exposure to mortgage related investments. Temasek Holdings agreed to purchase the funds and increase its investment in the company by $3.4 billion. Andrew Cuomo, New York Attorney General, threatened to sue Merrill Lynch in August 2008 over its misrepresentation of the risk on mortgage-backed securities. A week earlier, Merrill Lynch had offered to buy back $12 billion in auction-rate debt and said it was surprised by the lawsuit. Three days later, the company froze hiring and revealed that it had charged almost $30 billion in losses to their subsidiary in the United Kingdom, exempting them from taxes in that country. On August 22, 2008, CEO John Thain announced an agreement with the Massachusetts Secretary of State to buy back all auction-rate securities from customers with less than $100 million in deposit with the firm, beginning in October 2008 and expanding in January 2009. On September 5, 2008 Goldman Sachs downgraded Merrill Lynch’s stock to “conviction sell” and warned of further losses at the company. Bloomberg reported in September 2008 that Merrill Lynch had lost $51.8 billion on mortgage-backed securities as part of the subprime mortgage crisis. Merrill Lynch, like many other banks, became heavily involved in the mortgage-based collateralized debt obligation (CDO) market in the early 2000s. According to an article in Credit magazine, Merrill’s rise to be the leader of the CDO market began in 2003 when Christopher Ricciardi brought his CDO team from Credit Suisse First Boston to Merrill. In 2005 Merrill took out advertisements in the back of Derivatives Week magazine, touting the fact that its Global Markets and Investing Group was the “#1 global underwriter of CDOs in 2004″. To provide a ready supply of mortgages for the CDOs, Merrill purchased First Franklin Financial Corp., one of the largest subprime lenders in the country, in December 2006. BusinessWeek would later describe how between 2006 and 2007, Merrill was “lead underwriter” on 136 CDOs worth $93 billion. By the end of 2007, the value of these CDOs was collapsing, but Merrill had held onto portions of them, creating billions of dollars in losses for the company. In mid-2008, Merrill sold a group of CDOs that had once been valued at $30.6 billion to Lone Star Funds for $1.7 billion in cash and a $5.1 billion loan. In April 2009, bond insurance company MBIA sued Merrill Lynch for fraud and five other violations. These were related to the credit default swap “insurance” contracts Merrill had bought from MBIA on four of Merrill’s mortgage-based collateralized debt obligations. These were the “ML-Series” CDOs, Broderick CDO 2, Highridge ABS CDO I, Broderick CDO 3, and Newbury Street CDO. MBIA claimed, among other things, that Merrill defrauded MBIA about the quality of these CDOs, and that it was using the complicated nature of these particular CDOs (CDOs squared and cubed) to hide the problems it knew about in the securities that the CDOs were based on. However, in 2010 Justice Bernard Fried disallowed all but one of the charges: the claim by MBIA that Merrill had committed breach of contract by promising the CDOs were worthy of an AAA rating when, it alleges, in reality they weren’t. When the CDOs lost value, MBIA wound up owing Merrill a large amount of money. Merrill disputed MBIA’s claims. In 2009 Rabobank sued Merrill over a CDO named Norma. Rabobank later claimed that its case against Merrill was very similar to the SEC’s fraud charges against Goldman Sachs and its Abacaus CDOs. Rabobank alleged that a hedge fund named Magnetar Capital had chosen assets to go into Norma, and allegedly bet against them, but that Merrill had not informed Rabobank of this fact. Instead, Rabobank alleges that Merrill told it that NIR Group was selecting the assets. When the CDO value tanked, Rabobank was left owing Merrill a large amount of money. Merrill disputed the arguments of Rabobank, with a spokesman claiming “The two matters are unrelated and the claims today are not only unfounded but weren’t included in the Rabobank lawsuit filed nearly a year ago”. Significant losses were attributed to the drop in value of its large and unhedged mortgage portfolio in the form of collateralized debt obligations. Trading partners’ loss of confidence in Merrill Lynch’s solvency and ability to refinance short-term debt ultimately led to its sale. During the week of September 8, 2008, Lehman Brothers came under severe liquidity pressures, with its survival in question. If Lehman Brothers failed, investors were afraid that the contagion could spread to the other surviving investment banks. (Lehman Brothers filed bankruptcy on September 15, 2008, after government officials could not find a merger partner for it.) On Sunday, September 14, 2008, Bank of America announced it was in talks to purchase Merrill Lynch for $38.25 billion in stock. The Wall Street Journal reported later that day that Merrill Lynch was sold to Bank of America for 0.8595 shares of Bank of America common stock for each Merrill Lynch common share, or about US$50 billion or $29 per share. This price represented a 70.1% premium over the September 12 closing price or a 38% premium over Merrill’s book value of $21 a share, but that also meant a discount of 61% from its September 2007 price. Congressional testimony by Bank of America CEO Kenneth Lewis, as well as internal emails released by the House Oversight Committee, indicate that Bank of America was threatened with the firings of the management and board of Bank of America as well as damaging the relationship between the bank and federal regulators, if Bank of America did not go through with the acquisition of Merrill Lynch. Bank of America has resolved one of the largest and most embarrassing pieces of litigation related to its merger with Merrill Lynch in 2008. But the settlement comes with a pretty hefty price tag, since the bank has agreed to pay $2.43 billion to end the lawsuit. That monetary award ranks it as one of the largest settlements in a securities class-action case, behind the settlement over the disastrous AOL–Time Warner merger. The acquisition of Merrill caused Bank of America plenty of headaches by adding toxic mortgage assets to its balance sheet on top of what the bank took on when it bought Countrywide Financial. The bank has also been fighting with Fannie Mae and Freddie Mac over whether it will have to take back bad mortgages packaged into mortgage-backed securities. The lawsuit whose settlement was announced Friday accused Bank of America of misleading its shareholders in soliciting their votes for the merger by not disclosing the deterioration in Merrill’s financial position. It also faults the bank for approving $5.8 million in bonuses to its executives despite the problems. The net result was that Bank of America’s shareholders approved the acquisition of Merrill at a higher price than should have been paid. And because damages are calculated in a securities fraud claim based on this measure, the claims had the potential to reach $50 billion — the difference between what Bank of America paid for Merrill and what it was worth at the time of the acquisition. The $2.43 billion payment comes on top of the $20 million settlement resolving a shareholder derivative action in May, and the $150 million penalty imposed in 2010 in a case filed by the Securities and Exchange Commission over the proxy disclosure. The S.E.C. settlement originally called for the bank to pay only $33 million, but United States District Court Judge Jed S. Rakoff rejected it because it would have been unfair for shareholders to foot the bill when they were on the receiving end of the faulty disclosures in the proxy solicitation. Bank of America disclosed that the payment for the latest settlement would come from its litigation reserves, including an additional $1.6 billion it is adding this quarter to cover the costs of its litigation. That is a pretty significant hit to its bottom line. But like all such settlements, it does not come with any admission of liability, and the bank asserted in a statement that it was done “to eliminate the uncertainties, burden and expense of further protracted litigation.” Ultimately, as much as the payment hurts, Bank of America is probably quite happy with the settlement given that it could have potentially faced billions of dollars more in liability in the case. Investors, however, won’t be the ones to get rich from this payment. Bank of America will be using its own money to pay those who were shareholders at the time of the Merrill merger. In other words, as Judge Rakoff complained about the S.E.C. settlement, the current shareholders will be paying previous ones. Moreover, up to a third of the settlement amount could go to the plaintiffs’ lawyers. The people who led Bank of America at the time — including the former chief executive Kenneth D. Lewis — will not pay a dime because the company is required to pick up their legal expenses as part of their executive contracts. Also as part of the latest settlement, the bank agreed to continue until 2015 a number of corporate governance measures that it first puts in place as part of its agreement with the S.E.C. in 2010. The cost of these measures will be minimal and not require the commitment any significant resources. That leaves one last piece of litigation outstanding from the Merrill acquisition: a lawsuit by then New York Attorney General Andrew M. Cuomo for a violation of the Martin Act, the state’s broad securities fraud law. Filed on the same day that the S.E.C. settled its case, it accuses the bank, Mr. Lewis, and the former chief financial officer Joseph L. Price of misleading shareholders about Merrill’s financial condition. If the New York case goes to trial, it will dredge up a host of issues about what the executives knew about the extent of the problems at Merrill. To defend themselves, Mr. Lewis and Bank of America could try to offer evidence about the role of the federal government in pushing him to complete the deal during the throes of the financial crisis. Having paid out a total of $2.6 billion so far to settle lawsuits over the Merrill acquisition, Bank of America no doubt wants to put this issue as far behind it as possible. Whether it can reach an agreement with New York Attorney General Eric Schneiderman, who is now in charge of the case, remains to be seen. So far, the state has not shown any interest in backing away from its accusations . In the meantime, the real losers are Bank of America shareholders who have been asked to pay much more for Merrill than seems justified. The CEO at that time, David Komansky, said, “I want … to publicly apologize to our clients, our shareholders, and our employees,” for the company falling short of its professional standards in research. On June 26, 2007, the U.S. Equal Employment Opportunity Commission (EEOC) brought suit against Merrill Lynch, alleging the firm discriminated against Dr. Majid Borumand because of his Iranian nationality and Islamic religion, with “reckless disregard” for his protected civil rights. The EEOC lawsuit maintains that violations by members of the firm were intentional and committed with malice. In another case concerning mistreatment of another Iranian employee by Merrill Lynch on July 20, 2007, a NASD arbitration panel ordered Merrill Lynch to pay its former Iranian employee, Fariborz Zojaji, $1.6 million for firing him due to his Persian ethnicity. Merrill Lynch’s actions prompted reactions from both the National Iranian-American council, and the American-Arab Anti-Discrimination Committee. In its June 2008 issue, Diversity Inc. named Merrill Lynch one of the top 10 companies for lesbian, gay, bisexual, and transgendered employees, and the No.7 top company in the US for diversity overall. In 2007, Merrill Lynch was named the No.2 best company in the US for people with disabilities by Diversity Magazine. As of June 5, 2008, Merrill Lynch has created the West Asian, Middle Eastern and North African (WAMENA) Professional Network to help support and provide additional resources for employees of diverse backgrounds. In May 2008, Merrill Lynch was named the No.1 US company for “Diverse College Graduates” by Diversity Edge magazine, edging out Microsoft for the top spot on the rankings. In 2002 Merrill Lynch settled for a $10 million civil penalty as a result of improper activities that took place out of the firm’s Fort Lee New Jersey office. Three financial advisors, and a fourth who was involved to a lesser degree, placed 12,457 trades for a client Millennium Partners in at least 521 mutual funds and 63 mutual fund sub-accounts of at least 40 variable annuities. Millennium made profits in over half of the funds and fund sub-accounts. In those funds where Millennium made profits, its gains totaled about $60 million. Merrill Lynch failed to reasonably supervise these financial advisers, whose market timing siphoned short-term profits out of mutual funds and harmed long-term investors. Merrill Lynch arranged for payment of billions in bonuses for 2008 performance in what appeared to be “special timing”, despite reported losses of $27 billion. These bonuses totaling $3.6 billion were one-third of the money they received from the feds’ TARP bailout. The Merrill bonuses were determined by Merrill’s Compensation Committee at its meeting of December 8, 2008, shortly after BOA shareholders approved the merger but before financial results for the fourth quarter had been determined. This appeared to be a departure from normal company practice, since the type of bonus Merrill awarded was a performance bonus that, according to company policy, was supposed to reflect all four quarters of performance and was paid in January or later. In this case, however, the bonuses were awarded in December before fourth-quarter performance had been determined. ^ Jump up to: a b “Bank of America Corporation Annual Report 2012″ (PDF). Bank of America Corporation. Retrieved 22 December 2013. Jump up ^ “Charles Merrill, Broker, Dies; Founder of Merrill Lynch Firm”. The New York Times. October 7, 1956. Jump up ^ “Merrill Lynch Wealth Management”. Merrill Lynch Wealth Management. Retrieved 21 December 2013. Jump up ^ “About Merrill Lynch”. Ml.com. Retrieved July 11, 2011. Jump up ^ Sep 2008, the same weekend that Lehman Brothers was allowed to fail. Jump up ^ “Bank of America Finishes Merger of Merrill Lynch Into Parent”. Bloomberg. 21 January 2013. Retrieved 1 October 2013. Jump up ^ “Bank of America Simplifies Corporate Structure”. Bank of America Corporation. Retrieved 21 December 2013. Jump up ^ “McCrory Stores Corporation,” display advertisement, The New York Times, December 15, 1915, p. 18. In full: An Investment embracing safety, good income, and possibilities for considerable advancement in market value is presented in the Preferred Stock of the McCrory Stores Corporation. Price to yield 7%. Write for Circular T. M. MERRILL, LYNCH & CO. 7 Wall Street, NEW YORK. Penobscot Bldg. DETROIT. Telephone Rector 4940. Jump up ^ “Wire House”. Time (1). February 4, 1935. Jump up ^ “Bigger Biggest”. Time. November 10, 1930. Jump up ^ Curious Services. Life. June 27, 1938. ^ Jump up to: a b David A. Heenan, Warren Bennis (1999). Co-leaders: the power of great partnerships. John Wiley and Sons. Jump up ^ “$15,000,000 Sought By Crucible Steel.” The New York Times, December 19, 1940, p. 39, lists “Merrill Lynch, E. A. Pierce and Cassatt,” with a single comma following Lynch and the word “and” rather than an ampersand, as one of a number of firms underwriting an issue of bonds by Montana-Dakota Utilities Company. Jump up ^ Barrie A. Wigmore (1985). The crash and its aftermath: a history of securities markets in the United States, 1929–1933. Greenwood Publishing Group. Jump up ^ Merrill Lynch – Total Merrill – Total Merrill. Askmerrill.ml.com (November 18, 2009). Retrieved July 11, 2011. Jump up ^ Edwin J. Perkins (1999). Wall Street to Main Street: Charles Merrill and Middle-Class Investors. Cambridge University Press. Jump up ^ Ron Chernow (1990). The House of Morgan. Touchstone Books. ^ Jump up to: a b c Jenny Anderson (November 15, 2007). “NYSE Chief Is Chosen to Lead Merrill Lynch”. The New York Times. Retrieved September 14, 2008. Jump up ^ “Merrill Hires Finance Chief”. The New York Times. December 4, 2007. Retrieved December 12, 2007. Jump up ^ “Tutwiler follows Thain to Merrill”. Investment News. December 11, 2007. Retrieved 2011-09-21. ^ Jump up to: a b Eric Dash (December 25, 2007). “Merrill Lynch Sells Stake to Singapore Firm”. The New York Times. Retrieved September 14, 2008. ^ Jump up to: a b c Louise Story (July 11, 2008). “Chief Struggles to Revive Merrill Lynch”. The New York Times. Retrieved September 14, 2008. Jump up ^ “Merrill Lynch Announces Substantial Sale of U.S. ABS CDOs, Exposure Reduction of $11.1 billion”. Market Watch. July 28, 2008. Retrieved September 14, 2008. Jump up ^ “Merrill Lynch to cut mortgage-backed securities, raise new capital by issuing shares”. International Herald Tribune. July 29, 2008. Retrieved September 14, 2008. ^ Jump up to: a b “Lawsuit threat to Merrill Lynch”. British Broadcasting Corporation. August 15, 2008. Retrieved September 14, 2008. Jump up ^ Frank Quaratiello (August 22, 2008). “Merrill Lynch settles up”. The Boston Herald. Retrieved September 14, 2008. ^ Jump up to: a b Brett Miller; Chua Kong Ho (September 5, 2008). “Merrill Lynch Cut to ‘Sell’ at Goldman on Writedowns”. Bloomberg. Retrieved September 14, 2008. Jump up ^ Dalia Fahmy (May 1, 2005). “Merrill Lynch (profile)”. Credit magazine (as reprinted at risk.net). Retrieved April 29, 2010. Jump up ^ “Derivatives Week, Merrill Lynch advertisement” (PDF). November 7, 2005. Retrieved April 29, 2010. Jump up ^ Tully, Shawn (November 12, 2007). “Wall Street’s money machine breaks down”. CNN. Jump up ^ Goldstein, Matthew (October 25, 2007). 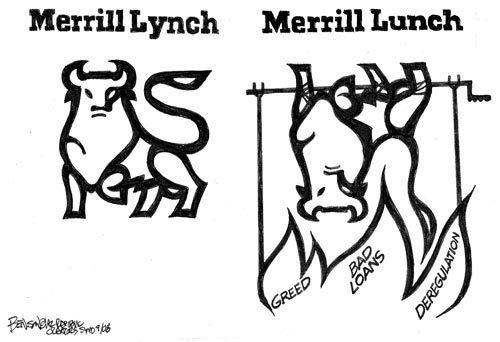 “Why Merrill Lynch Got Burned”. Bloomberg BusinessWeek. Jump up ^ Keoun, Bradley; Harper, Christine (July 29, 2008). “Merrill to Sell $8.5 billion of Stock, Unload CDOs”. Bloomberg. Retrieved April 29, 2010. Jump up ^ Boyd, Roddy (August 6, 2008). “Merrill’s picked pockets”. CNN. Retrieved April 26, 2010. Jump up ^ Supreme Court of New York County (April 2009). “MBIA Insurance Co. v Merrill Lynch” (PDF). MBIA. Retrieved April 23, 2010. Jump up ^ Ng, Serena (May 1, 2009). “MBIA Sues Merrill Lynch”. The Wall Street Journal. Retrieved April 23, 2010. Jump up ^ Edith Honan, ed. Gerald E. McCormick (April 9, 2010). “Update 1-Judge dismisses most of MBIA’s suit vs Merrill”. Reuters. Jump up ^ Eisinger, Jesse; Bernstein, Jake (April 9, 2010). “A Lawsuit Suggests Merrill Lynch’s Role”. ProPublica. Retrieved April 23, 2010. Jump up ^ Pickhardt, Jonathan (April 16, 2010). “Letter to Judge Bernard Fried, NY Supreme Court re: Rabobank and Merrill Lynch”. ProPublica. Retrieved April 23, 2010. Jump up ^ Mollenkamp, Carrick & Ng, Serena (December 27, 2007). “Wall Street Wizardry Amplified Credit Crisis”. The Wall Street Journal. Retrieved April 23, 2010. Jump up ^ McQuillen, William (April 16, 2010). “Merrill Used Same Alleged Fraud as Goldman, Bank Says”. Bloomberg. Retrieved 19 August 2014. Jump up ^ Andrew Ross Sorkin (September 14, 2008). “Bank of America in Talks to Buy Merrill Lynch”. The New York Times. Jump up ^ Matthew Karnitschnig; Carrick Mollenkamp; Dan Fitzpatrick (September 14, 2008). “Bank of America Reaches Deal for Merrill”. The Wall Street Journal. Jump up ^ Rusli, Evelyn (September 15, 2008). “The Universal Appeal Of BofA”. Forbes. Archived from the original on September 20, 2012. Jump up ^ LOUISE STORY and JO BECKER (June 11, 2009). “Bank Chief Tells of U.S. Pressure to Buy Merrill Lynch”. The New York Times. Retrieved June 13, 2009. Jump up ^ Scott Lanman and Craig Torres (June 10, 2009). “Republican Staff Says Fed Overstepped on Merrill Deal (Update1)”. Bloomberg. Retrieved June 13, 2009. Jump up ^ “A.I.G. Lists Firms It Paid With Taxpayer Money”. The New York Times. March 15, 2009. Jump up ^ “Merrill to pay $125 million settlement to investors”. Reuters. September 5, 2007. Jump up ^ Ackman, Dan (September 20, 2004). “Enron’s Nigeria Barge: The Real Deal”. Forbes. Jump up ^ Associated, The. (June 27, 2007) “U.S. Sues Merrill on Treatment of Muslim”. The New York Times. June 27, 2007. Retrieved July 11, 2011. Jump up ^ “EEOC vs. Merrill Lynch $ Co. – Complaint]” (PDF). The Wall Street Journal. Retrieved July 11, 2011. Jump up ^ “Discrimination Ruling Another Black Eye for Merrill”. EFinancialCareers. Retrieved July 11, 2011. Jump up ^ “Fired Iranian broker wins $1.6M from Merrill”. International Herald Tribune. March 29, 2009. Retrieved July 11, 2011. Jump up ^ “Amended Award” (PDF). The Wall Street Journal. July 20, 2007. Retrieved September 15, 2008. Jump up ^ “EEOC: Merrill Lynch Hired Iranian for His Brains, Fired Him for His Nationality”. NIA Council. July 4, 2007. Archived from the original on June 19, 2008. Retrieved September 15, 2008. Jump up ^ “PPCo. Epubxpress”. Magazine.diversityinc.com. Retrieved July 11, 2011. Jump up ^ “The Diversity Edge Announces its 2008 Best Companies for Diverse Graduates”. The Diversity Edge. May 29, 2008. Retrieved September 15, 2008. Jump up ^ “Single Anti-Gay Remark Sufficient for Hostile Workplace Claim, N.J. Court Says”. Law.com. August 15, 2008. Retrieved September 15, 2008. Jump up ^ “Merrill Lynch to Pay $10 million in New Jersey Settlement”. ConsumerAffairs.com. March 15, 2005. Retrieved July 11, 2011. Jump up ^ Weiner, Rachel (March 30, 2009). “Merrill Lynch Bonuses 22 Times The Size Of AIG”. Huffington Post. Retrieved July 11, 2011. ^ Jump up to: a b Mcgee, Suzanne (February 22, 2010). “The Best U.S. Financial Advisors”. Barron’s. Retrieved July 11, 2011. Jump up ^ “BofA Merrill Lynch Global Research Rankings”. Ml.com. Retrieved July 11, 2011. Jump up ^ The Banker’s Investment Banking Awards, 2013 – the winners. The Banker. Retrieved on 2013-10-23. Jump up ^ “Merrill Lynch & Co, Inc.”. Retrieved October 17, 2012. Jump up ^ EPLZzYhK. “Merrill Lynch”. Retrieved October 19, 2012. ^ Jump up to: a b “Equity Compensation Plan”. Retrieved October 17, 2012. Jump up ^ “Merrill Edge Official Website”. Retrieved 16 March 2015. Jump up ^ “Bank of America Launches New ‘Merrill Edge’ Online Investing Tool”. My Bank Tracker. 2 May 2011. Retrieved 15 March 2015. Jump up ^ Veneziani, Vince (17 June 2010). “Merrill Lynch Launching Online Discount Brokerage Next Monday”. Business Insider. Retrieved 15 March 2015. Jump up ^ Southall, Brooke (20 June 2010). “Why the launch of Merrill Edge may be a shrewder move by BoA than it first appears”. RIA Biz. Retrieved 15 March 2015.